EVERYTHING in the ROOM for a BUCK! We have books – books – books to sell! Our final One-Day Book Sale is Saturday, July 22 from 10am – 4pm in the Workforce Room at the Napa City/County Library. The donations have been pouring in and we are running out of room so …we will again have a wide selection of books available and this time the cost will only be $1. What a bargain!!! So please join us on Saturday the 22nd for the best bargains in books! We are pleased to announce that on the morning of Saturday, June 24th, we have expanded our one-day sale. In addition to the book sale in the Workforce Room, we will be hosting FREE BOOKS FOR KIDS on the patio of the library from 10am to 12:30pm. As with our regular sales, if a child is accompanied by an adult they will receive THREE (3) FREE BOOKS. In the Workforce Room from 10am – 4pm we will offer a selection of our excellent donations for sale. What a great way to stock up for your summer reading! Whether you have interest in popular fiction, cookbooks, history or the sciences, we will have many titles for sale. And for all of you baseball fans, we have over 100 baseball related books ready for sale. Please join us!! FINALLY! The library construction project that cut off access to the outdoor donation bins is complete. 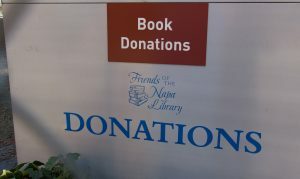 Donations are again being taken in the book bins in the delivery area of the library. They are located in the northeast corner of the library building and are accessible 24 hours a day/ 7 days a week. Donations are no longer being accepted in the bin in the lobby of the library. So when you are doing that spring cleaning and need to find a home for the books you no longer need/want, you can drop them off anytime in the bins. If you have a large donation, please contact Bruce Taylor, Book Sale Manager at (707) 253-4614. Our First One-day Book Sale – An Alternative to BottleRock! 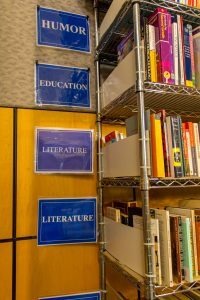 Because construction and remodeling projects at the Napa County Library have played havoc with our BOOK SALE SCHEDULE, the Friends of the Napa Library has arranged to hold three smaller sales before we get back to our “normal” schedule in August. These sales are open to members of the Friends and non-members alike. The first of these “one day” sales will be held on Saturday, May 27 from 10 am to 5 pm in the Workforce Room at the Library. The Workforce Room is located directly across from the information desk. This sale will feature only Better/Special Priced Books. As donations come in, we have set aside those books that we feel have something about them that sets them apart from our general offerings. They can be rare, first editions, complete sets of popular fiction or something that strikes us as being above the ordinary. As with the special books in our normal sales, the books will be priced individually and the prices will be marked on each book. These Better/Special Priced Books have always been a popular section of our normal sales. Regular shoppers look forward to see what treasures have been donated to the Friends and you never know what will be for sale this time!! Please join us on Wednesday, March 15, 2017 at 4:00 pm at our Annual General Meeting. The meeting will be held at the Gasser Foundation Board Room at 433 Soscol Avenue, Suite 120 in Napa. We will be installing new board members, reviewing the results from our current year’s operations as well as planning for the upcoming fiscal year. If you have any questions, please use the contact tab above. Our thanks to the Gasser Foundation for the use of their conference room.